$X$ can take any positive value. $X$ is a reasonably realistic pdf for a model of a share price of a bank in a year's time. The probability of $X$ taking a value in the range $(a, b)$ is the same as the chance of $X$ taking a value in the range $(-b, -a)$. $X$ is a reasonably realistic pdf for a model of human life expectancy. There is a number $a$ such that $P(x> a) \geq 2 P(x> 2a)$. 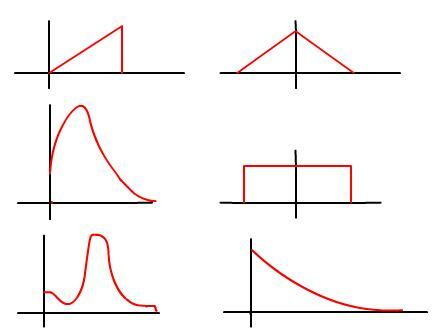 Which of the following six curves (ignoring scale) would be the potential candidates for these mathematical descriptions? Are multiple matches possible? What axes and scales would you choose in each case? Maths Supporting SET. Investigations. Physics. Maclaurin series. Mathematical modelling. Real world. Probability distributions, expectation and variance. Vectors. Matrices. Biology.